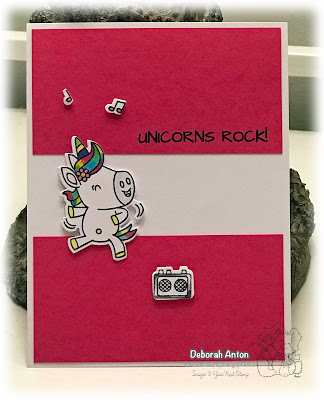 It's another Friday challenge over on the YNS challenge blog and once again, it's a great sketch that leaves so many possibilities when creating a card. I don't think I ever get tired of coloring in these cute unicorns. They are so much fun to color. Once I did, I cut her out and her rockin' stereo with the coordinating dies and popped it up while the sentiment is stamped directly onto the cardstock. Be sure to stop over to the YNS Blog to see all the fab creations some of the DT members have made this week. Thanks for popping in and have a great Friday!